how very joe of you. I love the pink swirly thingy, and basically the whole composition, but more mass to her hair might've been a good idea... looks like it's short on one side and uber long on the other. And the arm is quite wavy, like.. time-warp arm, hehe. Seriously though, quite spiffy, great figure. 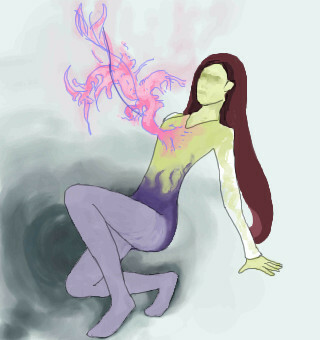 An artistic interpretation of heartburn or an Alien ripp'in outta someone's chest. Where's Ripply when you need her? I wonder what it feels like to have your breasts fondled by bubble gum?